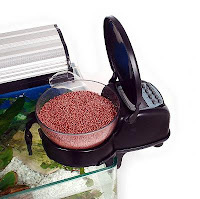 It is always a good idea to get an Automatic Fish Feeder in case you are going on a long holiday. Unlike other pets, fish needs less attention or worry because they actually can last 3-4 days without food. Provided that your aquarium has a good filtration system, it’s not necessary to even change the water at all until you return. But make sure that the whole system is stable without ammonia or nitrite level fluctuation and conduct routine water change right before you leave. An automatic fish feeder is basically a simple setup that includes a timer to start dropping the fish food at a preset interval. My visits to the aquarium stores show that the price for a unit usually range between $20 to $50 depending on the quality and mode of operation. So far, all the units that I’ve seen before are all battery operated with some having a digital display as well. Most people going on a holiday prefer to have the chores of feeding the fish assigned to neighbors or even friends. For me, depending on the number of day that I will be gone, usually it’s either I leave it alone without any intervention (if it’s only 3-4 days) but for longer period, maybe up to a week, then I will get an automatic fish feeder to help with the task. There are many reasons why I prefer not to have someone else feeding my pet. First of all, the person may not have experience with fish keeping and thus does not know how much to feed. In this case, there might be a risk of overfeeding and fouling the water. Second I prefer not to have strangers walking into my house and then leaving. That’s why for that reason an automatic fish feeder is good enough to take care of everything until I'm back from holiday.